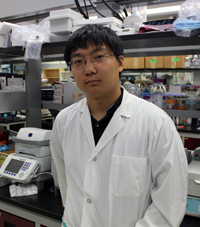 Alumnus update: Former Bowdish lab undergraduate Charles Yin wins prestigious Vanier scholarship for his MD/PhD work! Congratulations to former Bowdish lab undergraduate student Charles Yin on his week of accomplishments – publishing his paper on one of his undergraduate projects and winning a prestigious CIHR Vanier Scholarship for his MD/PhD work at UWO. This entry was posted in News and tagged alumni update, award, success!, undergraduate by Dr. Dawn M. E. Bowdish. Bookmark the permalink.